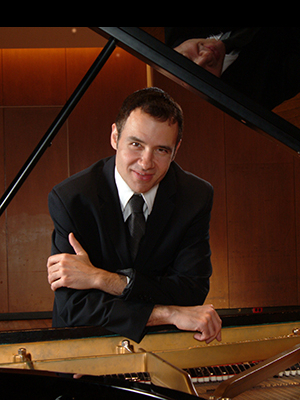 Dr. Tsitsaros is equally active as a composer, having won the composition competition at the 1992 National Conference on Piano Pedagogy, which launched an ongoing relationship with Hal Leonard Corporation. Several of his piano compositions have been selected by prestigious examination systems, including the National Federation of Music Clubs, the RCM examinations of the Royal Conservatory fo Music (Toronto), and the Gina Bachauer International Junior Piano Competition. Some of his more recent publications under Hal Leonard include Poetic Moments, Songs Without Words, Dances from Around the World, Sonatina Humoresque, and Lyric Ballads. His pedagogical reserach led him to conceive a technical system geared toward a safe and effective neuromuscular warm up. His Symmetrical Warm-Ups (Hal Leonard 2011), a set of short, transposable exercises, has received numerous accolades in well respected journals and has been showcased in workshops accross the United States and abroad. In 2001, he was artist-in-residence at the Helene Wurlitzer Foundation in Taos, New Mexico; the same year, he gave his New York debut recital at Weill Carnegie Hall. He regularly appears in workshops and conferences as a performer and lecturer in Europe, the United States, Russia, and Canada. Some of those events include the National Conference on Keyboard Pedagogy, the Music Teachers National Association Conference, and the International Conference on European Music Education (St. Petersburg, Russia.) In May of 2013, he was the invited artist/clinician for the prestigious Korean Association of Piano Pedagogy Symposium in Seoul, South Korea. During his Korean visit, he lectured and gave masterclasses in major universities in the Seoul area. Dr. Tsitsaros is also an editor and recording artist for the G. Schirmer Performance Edtions, specializing in the educational works of Joann Sebastian Bach. Four albums of his original compositions appear under the Centaur Record label (1998, 2007, 2011.) The latest of these recordings, featuring his "Cahier Tango", a series of twelve character tangos for piano, reflects his interest in the Argentinian tango. All albums have elicited enthusiastic reviews in various international music magazines. More recently, he was honored as 2014 Distinguished Composer of the Year by the MTNA (Music Teachers National Association) for his piano composition Three Preludes for Solo Piano: A Mythical Triptych (Hal Leonard, 2014.) Dr. Tsitsaros presented the winning composition at the 2015 MTNA National Conference in Las Vegas, Nevada.